I wanted to post some pictures of my kids from Halloween. 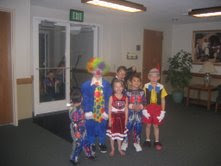 My wonderful little man, Tanner, was the cutest clown you have ever seen. It warmed my heart that he wanted to be a clown and He is the first child of mine to let me paint his face. Sydney was an East Side High Cheerleader (by the way, Mike wanted me to tell you that his junior year they defeated East High and extended their 18 game loosing streak in football). She even let me put a few curls in her hair and of course her everyday pony tail. She wants me to sign her up for cheerleading camp. The recreation has a class coming up that I think she would enjoy. 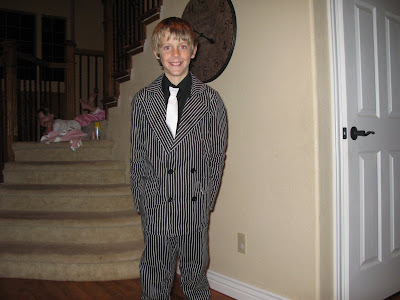 Blake was.....you guessed it....A GANGSTER. What can I say I was weak when he told me that just because he wanted to dress up like a gangster did not mean he was one. He also reminded me not to judge people. In the end he looked very hansome in the pinstripped suit and did a wonderful "put your hands up and give me all your money" impersonation. Courtney was a moo cow. She looked darling and when asked what a cow says she would always say moo. Although, she said that for any animal you asked about, up until yesterday. We had a great time at our Ward trunk or treat where we got lots of candy. We had a fun time at the wildlife experience where we got lots of candy. 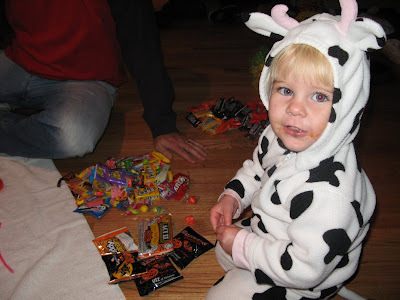 We had an enjoyable time trick or treating around our neighborhood. Courtney and Blake were the champion trick or treaters. The rest of us were cold and decided to go back home and give out candy. this picture cracks me up. funny how they all have their own ideas. very cute.